As I do research for my blog posts, it is becoming increasingly clear to me that all is not gloom and doom in the world of conservation. In between the wolf killings and the ATVs, there are many silent heroes who are making a difference and setting examples for the rest of us. I’ve already noted examples of positive conservation in previous posts. 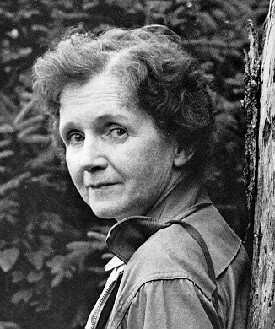 Rachel Carson, shown in the lead picture for this post, is probably the most well known conservation hero. But today, there are many silent and unsung heroes. In this post, I offer some examples that offer hope and encouragement to those of us who are sometimes overwhelmed by a sea of discouragement. Some of my conservation heroes are readers of this blog. A number of you, professionals in various fields of endeavor, have reached out to mentor me and encourage me as I write on various subjects. To those of you who are by my side, I am deeply grateful. Your efforts have resulted in a significant improvement in the material offered in this blog. Through your help, you have provided important information to a growing audience of readers and followers. As many of you know, I’m a big fan of passive restoration. In previous posts, I’ve been outspoken against the idea of killing wolves and other top predators either as a convenience to ranchers and farmers or by hunters who want a trophy. But, beneath the emotional rhetoric put out by the agricultural industry and hunting advocates, there are groups of conservation heroes who have emerged with successful stories about how ranching interests can be protected while preserving the top predators. 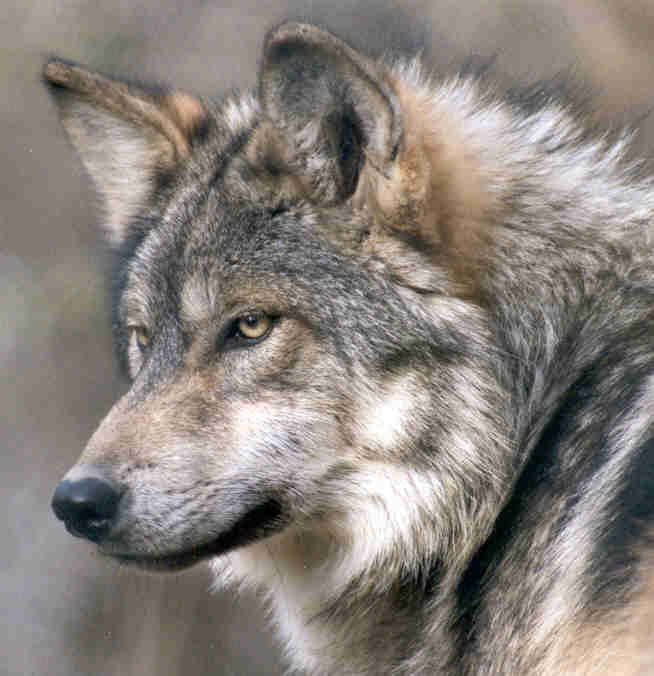 I begin by praising Yellowstone National Park for their reintroduction of the wolf as well as biologists Bill Ripple and Bob Bechta for developing the scientific evidence at Yellowstone that the great carnivores are revitalizing forces of Nature. Their work is chronicled in the wonderful video, Lords of Nature . From this work came the realization that these creatures are an important part of Nature’s ecosystems. They warrant non-lethal human measures to protect top predators while protecting livestock. The uncontrolled growth of the human population, and humanity’s use of land without consideration for other species has resulted in highly fragmented ecosystems. The result is the “corralling” of once free-roaming animal populations. Even our public lands do not usually provide for animal migration corridors. There has been a growing effort by some conservation heroes to correct this problem. 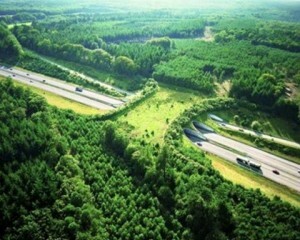 All over the world, we are seeing the construction of wildlife bridges that provide pathways for animal groups to roam from one sector of land to another. One example is Interstate highway I-90 in the Cascade Mountains of Washington state in the United States is providing a number of wildlife bridges. At one time, humanity regarded the Beaver as a pest because it’s dams destroyed or altered mankind’s designs for the flow of water. The Beaver’s pelt was highly prized. Consequently, many riparian ecosystems sustained damaging change. The San Pedro River that runs south to north from Cananea, Mexico to the Gila River in Northern Arizona suffered damage and change to its ecosystem as the Beaver population was decimated by mankind. The happy ending to this story is the reintroduction of the Beaver by the US Bureau of Land Management. This interesting video tells this success story. I’ve experienced conservation heroics in my own back yard. I recently wrote bout the groups of local residents and visitors who rescue newly hatched Olive Ridley sea turtles on beaches along the shores of the Sea of Cortez near San Carlos, Sonora, Mexico. In order to survive, these babies must walk from the inland side of the beach to the water line where they enter the sea. Their hazards during their walk are the desiccating heat of the sun and aerial predators such as vultures and gulls. Despite the fact that this beach is a protected reserve where there are signs prohibiting ATV activity, the ATVs are driven up and down the beaches endangering human beings and leaving deep ruts in the sand. These ruts, which run parallel to the waterline, prevent the newly hatched turtles from getting to the water from where they hatched . 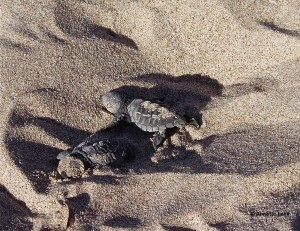 The baby turtles are caught in the ruts and are forced to move parallel to the beach rather than to the water. The caring souls that are my heroes pick up many of the little guys and carry them to the water. For two years now, working with government biologists, these conservation heroes have organized themselves to patrol the beaches looking for turtle nests and hatching activity. In the second year (2013) of this effort, volunteer groups and government organizations patrolled the beaches looking for new hatchings. Their efforts resulted in the saving of at least three hatching events with the little guys getting to the water safely. There is one set of conservation heroes with whom I am very proud to be associated. 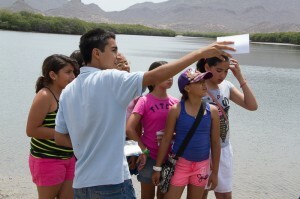 This group of high school students in Guaymas, , Mexico offer conservation education to elementary school students. I’ve written about these young heroes in a previous post . As of this writing, the program has had four successful sessions. An expanded program is now being planned under the sponsorship of a local university. The idea of developing a conservation consciousness in our young people is the primary goal of this group. It is a privilege for me to work with this young and energetic conservation team. Here are some pictures of this group at work. It is always a happy event for me when I write about conservation successes such as the examples I’ve noted in this blog. There are plenty more great stories to be told about our conservation heroes. I would be honored if you would take the time to share your conservation success stories in the comments section of this post. You are also invited to write a guest blog on some positive conservation event or experience. I’m thinking about creating a special section in my web site to permanently present these stories. Please help by contributing stories that you know about. If you don’t have time to write much, simply put the URL for a good story in a comment. I’ll finish it off for you and provide credit for your efforts. You might be interested in Cox Corporation’s web site where annual lists of conservation heroes are presented. Hi Bill. Very nice newsletter. I pinned it and posted it to http://scoop.it/t/ecoscifi. A very interesting and informative blog post. I shared this to all my social networks. Do you know Deb and Dennis Moroney from Sky Islands Ranch near McNeil. They would are conservation-minded ranchers and would make a great “conservation heroes” article. Also: Have you visited the source of the San Pedro? I’m thinking of venturing there to do some photography, and wondered what you might know, if anything, about that area. Sorry we weren’t able to connect while you were here. Perhaps another time…!